Miniature Wargaming is a hobby where the participants derive pleasure by simulating a 'real world' (I use the term very loosely) conflict situation using a scaled down representation of it. Most of the time we use lead or pewter soldier figures to represent the players in this situation. The sheer magnitude of the hobby makes a simple descriptive paragraph difficult at best. Suffice to say that we play out a "conflict situation" (Battle seems almost TOO restrictive a term for today's hobby, I think) in three dimensions. The physical area of the conflict is reproduced using suitably miniaturized terrain pieces, like a piece of greenish felt for grass, pebble for boulders, pieces of painted styrofoam to make hills, etc. Unlike boardgames, there are no 'hexes' to regulate movement (usually-- though this is not always the case). We like to use published rule sets (or we develop our own) to regulate movement, combat, and conflict resolution. As you can see, the toys we get to play with are pretty spectacular. 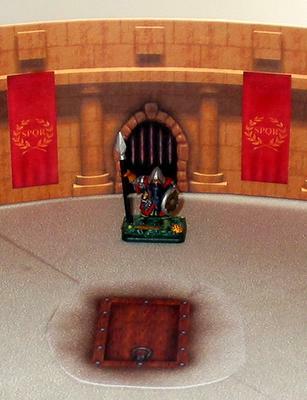 Not everything we play with is historically based, like the gladiators and napoleonic figures you see in Figs 1 and 2. Games on Science Fiction and Fantasy subjects have a huge market share, in fact, they pretty much dominate the hobby. ARF II was held at COLD WARS 2003. It went very well. HERE is a little bit of press we garnered for this game. BALLOONACY! (formerly Le Grande Courses Des Aerostats) made its debut at COLD WARS 2003. Click on the logo to see the recap. 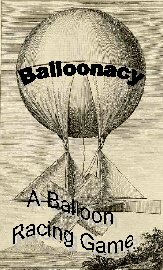 Balloonacy is a balloon racing game I designed as a companion to the (somewhat popular) LE GRAND CIRQUE rules I wrote for Victorian Science Fiction Races. I found that aerial racers uniformly won LGC events, due to not having the same problems with the terrain that the terrestial racers did. There wasn't an easy way to have a race in the air and on the ground at the same time-- so I created another game for the air. Balloonacy is the result of that process. The rules are interesting (to me) in that I wanted to create a diceless game from the outset where the player could control the ONE aspect of aerostat racing that his real-life counterpart. Wind and Terrain are determined by card draw; ballast is a finite resource that is used up during the race. There are a number of RULE SETS out there to suit anyone's taste, plus a surprising amount of FREE MATERIAL available on the web for the price of a download. For your first stop, I suggest visiting the Q'ran of miniature gaming, Bill Armintrout's excellent MINIATURES PAGE. Therein you will find an exhaustive list of gaming hobby manufacturers, links to projects, tutorials and replays, and other essays of surprising value. My preference for miniatures games is for the SKIRMISH game format. Skirmish games are, generally, a scale of conflict where the scale of figure to real life is 1 to 1, and the time scale is very short-- like 25 seconds a turn! Skirmish games tend to be fast and furious, and very deadly. On the other hand, Skirmish games tend to towards the wacky element that I like. I've put together what I hope is an interesting tribute to Wild West Skirmish Gaming here, at my WILD WEST SKIRMISH WARGAMING website. In addition to the rules above, there are a few more there, plust some useful charts for running Western Skirmish events, and pictures of some of our replays, and sources of figures and terrain. The SCARY MONSTERS project was an idea I had to include Hollywood style movie monsters in a skirmish setting. The setting I chose was quite naturally, a Hollywood-style Wild West scenario. SCARY MONSTERS sort of bends the universe of THE RULES WITH NO NAME to include rules for supernatural creatures such as CONSTRUCTS (Mud Men, Straw Men, and Dead Men), LYCANTHROPES (The Indian Wolf Spirit and the Western Style Lycanthrope), VAMPIRES transplanted West, Aztec MUMMIES, madmen, evil priests, tinkerers, and etc., etc., etc. My meandering, multipaged manuscript was eventually published by MWAN, and is also available on the SCARY MONSTERS OF THE GOLDEN WEST home page. As far as I'm concerned, the coolest naval combat period EVER was the days of Naval Warfare under oars-- the time of Roman and Hellenistic Galley warfare. 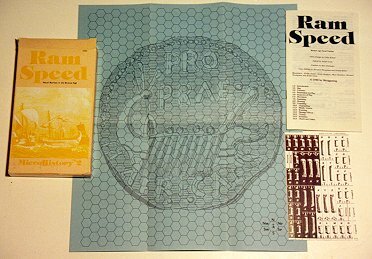 There are some very interesting professional rulesets out there, but the game I'm most interesting in porting to miniatures is an old BOARD microgame called RAM SPEED, put out by the beloved Metagaming of days gone by. The original RAM SPEED contents were fairly humble, as illustrated by the picture to the right here. The game isn't an all-inclusive study of the subject by any means, what it is is a fun, reasonably decent treatment of small ship actions during this era. It plays fast, which is a plus. I'm in the very slow process of converting this game to a miniatures game. So far, I've purchased some excellent NAVWAR FLEET PACKS (see Sample to the right, from the NAVWAR website) and mounted them on rectangular wooden bases, to which I've added their equivelant RAM SPEED stats on labels. I had to do a little bit of fudging as RAM SPEED only has four types of ships, and I have a much wider range of NAVWAR minis. As I have a nautical felt-hexmap terrain, the effect is terrific so far. I have a lot more painting to do yet, but I have enough done to replicate the basic game mix above. Here is a PDF of SHIP LABELS to convert the galley minis into Ram Speed stats. Another boxed wargame that converts well to minis is WAR GALLEY from GMT Games. I have not tried this yet but I have played with demonstration paper miniatures at one point, at a historical miniature convention, and it played well on a hex mat. I've also picked up Rod Langton's NAUMACHIAE lately, and I find it a tad overcomplicated for what I'm looking for. Still, I want to give it a fair assessment so I'm eventually going to rebase some galleys for that game. One of the problems I have with NAUMACHIAE is that it is tens times more complex that what I am used to playing; it looks more daunting that it probably is. I'm not inclined to purchase a large number of Langton miniature ships (which are out of my price range), so it may be a while before I get to this one. The recent appearance of a lot of keeno Gladiator figures in the budget bin of my local hobby store has rekindled my interest in this time period. So far, I'm ressurecting my old GLADIUS! boardgame concept using miniatures, which seems to work, but may create a whole new minis game out of it. You never know. My local game club also is using a modified version of BLOOD AND SWASH by Buck Surdu to run gladiator games. There are some special sheets to modify B&S for Gladiator and Ancients Combat-- these are a nice first step, but seem to be based solely upon the movie Gladiator and not on history (you will need a PDF viewer to read those documents, btw). More will be here eventually ... and maybe another page dedicated to this subgenre. One of these days I'm going to get my act together and attempt to build one of these. In the meantime, click on the link for tips on Coliseum construction. If you want to accomplish a decent arena for extremely cheap, check out the paper arena you can print and assemble here. This is the latest submission to the VISIONS IN PAPER contest held on the Brabantini yahoogroup. Check in the files section under Visions in Paper. Eventually, it will be hosted on the PAPERWORLDs website. I've found TWO free gladiator rule sets out there on the web. Worth looking into. Build a Battlefield Page Check it out! RAM SPEED PBeM: A PBeM Emporium Page, one of mine.